Inventories are a key indicator of market balances. Unlike many other industries, information on the ebbs and flows of lumber stocks is largely lacking. To get a sense for supply/demand balances, intelligence on stocks at two levels in the supply chain would be desirable: At mills, and between mills and final users. Unfortunately data collection of lumber stocks at the mill level is sketchy and, if done, tardily disseminated. Mill inventories in Canada are compiled by Statistics Canada but are reported with a lag of about two months. In the U.S. South and Northeast, they are not collected at all. Only the Western Wood Products Association (WWPA) gathers mill inventory data in the West from a sample of firms, which they publish weekly. Data on stocks between mills and end users are even sparser. Each month the Census reports inventories for “merchant wholesalers” including “lumber” (NAICS 4233). The data for March was released on May 8th, but is of limited utility because the number is not differentiated by product (i.e. 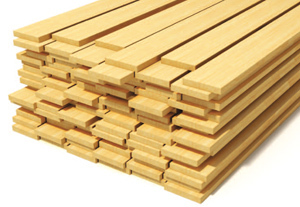 lumber, plywood, millwork etc. ), nor given in volumetric measures. Rather, they are based on dollars unadjusted for price changes. Within the industry, most insights on inventory conditions are based on hearsay. Only Random Lengths attempts a quantitative description of retail stocks based on a subjective index of inventories supplied monthly by a sample of their retail correspondents. For inventories between mills and end users, the ideal means to get such data would be by way of regular statistical surveys. That being beyond my means, I have developed another way based on two measures: Volume flows into and out of the distribution system. The accounting framework to track and systematically update estimates of inflows and outflows is summarized below. The variables for outflows are compiled from the regular census reports that track the economy such as housing starts, the average size of homes, value of construction put in place and so on. The weakest link is residential remodeling. Originally, I used the estimates from the Harvard Joint Center for Housing Studies but later supplemented those with data on remodeling permits compiled by BuildFax and monthly retail sales by “Building material and supply dealers” (NAICS 4441) reported by the census. For the usage rate in each of these sectors, I obtained estimates from various U.S. Forest Service and industry market tracking studies. Those factors can change and thus a check on their validity is that over several years encompassing a business cycle the grand total of estimated end use should approximate apparent end use (shipments plus net imports). To the extent that they significantly deviate, I adjust the factors periodically to bring the two into line.